We only accept files from "verifiable" attorneys and government agencies. Other file uploads will be ignored. To preserve neutrality, we do not communicate with the end client. Once you select your files, you will be asked to provide your name, email and optional message. 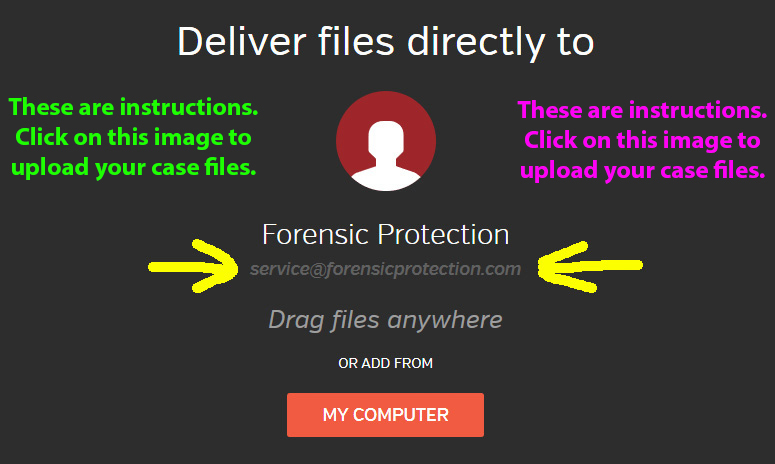 We will use this information to link your uploaded files to our case records. It is helpful if you include the case name in the message area, or you include a scan of your completed order form with the files that you are uploading to our lab. If we are only to work upon a small portion of your recording, do NOT edit or resave your file. Instead, send us an exact copy of the original recording and denote the specific area of interest on your order form. Remember to include any special viewing/playing software that may be required. Your upload begins immediately and will be an encrypted transmission with a progress indicator. This process may require minutes or hours depending on the total size of your files, and the speed of your internet connection. Be patient and do not navigate away from the upload webpage, or close your web browser, until the upload process is complete. If you need to visit other web sites, use other tabs in your browser. For massive files, consider starting the upload just prior to going home for the day. At the completion of the upload, you will receive immediate confirmation at the email address that you provided.